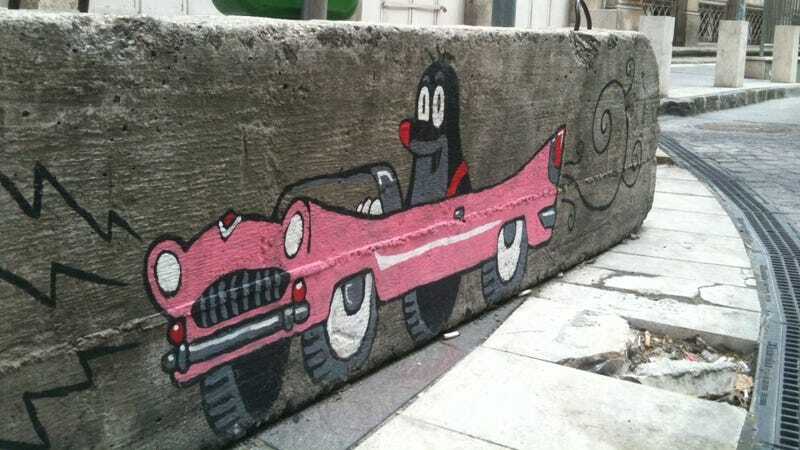 A year ago, I wrote about Czech illustrator Zdeněk Miler’s animated series Krtek (“The Little Mole”), whose title character drives a wind-up pink Cadillac and was taken to space for real aboard Space Shuttle Endeavour on STS-134. Miler died last December at the age of 90, but his spirit lives on: this crash barrier, decorated with Krtek in his pink Cadillac, is near the entrance of a Budapest parking garage. Prague must be teeming with Krteks in all shapes and sizes these days.